Beverly's Official Blog | News and findings from world of crafts, scrapbooking and more: March In-Store Coupon! That's right!... 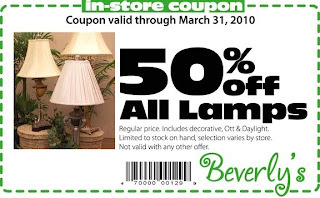 Print our new March coupon and bring with you on your next visit to your local Beverly's store and receive 50% off all lamps. This offer is limited to what we have on our shelves, so hurry in before they all disappear! Wow! I'm glad to post a comment about this Beverly's store in Daly City. Our school just recently had a fundraiser and the PTSA parents were fighting over who would get to go shopping at Beverly's. This is a fabulous store with just about everything you can think of for sewing, crafts, scrapbooking, paper supplies, felt, batting, flowers, stamps, childrens' crafts and tons more. Go in there and you'll have a hard time leaving. I'm never disappointed when I go to Beverly's in Daly City. Their Christmas stock of ribbons and decorations as well as other seasonal decs are always fabulous. The staff is always friendly and helpful. I recently spoke with the manager of this store. I am pleased to say he is not only adamant about customer satisfaction, he is also interested in the welfare of the community that shops his store. Parking also makes this an easy place to run in and run out if you need a quick item. I am always pleased to find that the item I am shopping for is frequently ON SALE for that week. Discount! That's the buzz word at Beverly's. There's a new group of items on sale every week. A fun place to shop. Also, lots of other nice shops in the Westlake Mall area. Nice atmosphere. Shop and then have lunch or a coffee. I highly recommend this Beverly's.